Free Domestic Shipping (Does Not Include Custom Orders, Wholesale Orders, & Cannot Be Combined With Any Other Offers). All continental U.S. retail orders over $50 qualify for Free Ground Shipping! Qualifying orders will be consolidated to one shipment, which may add additional time to the final delivery. To receive free shipping, input the code 2019USASHIP at check-out. Receive a 10% discount on ALL future orders as part of our Loyalty Discount Program. Create a free account the first time you place an order. On future orders, simply sign in to your account before checkout, and the shopping cart will recognize you as a repeat customer, and discount your order 10%! There are no codes to enter, and no limit to how many times you can use this discount. This offer cannot be combined with any other codes/offers or promotions. 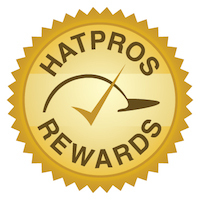 We appreciate our loyal customers, and hope you keep coming back to The Hat Pros for all your headwear needs!